These flakey phyllo dough wrapped asparagus lend a touch of elegance to your veggie side dish. 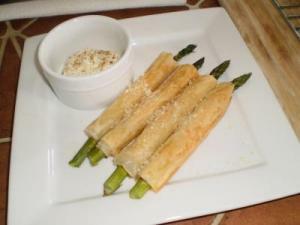 This page contains a phyllo wrapped asparagus recipe. I am a big time asparagus lover and the twist on this recipe found at Allrecipes piqued my interest to try and it was excellent! Lightly brush 1 sheet of phyllo dough with butter and sprinkle with Parmesan cheese. 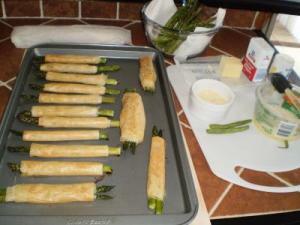 Roll 2 asparagus spears up with the prepared phyllo dough and place seam side down on a baking sheet. Repeat until all the asparagus spears are rolled. Brush each roll with butter and sprinkle with Parmesan cheese. Bake until the phyllo is golden brown and crispy, about 15 to 18 minutes. Deeli, Thanks for this recipe. It was quick and very easy. I plan on making them for Easter Brunch. I should have let them brown a bit longer...YUMMY! I even left them out on the counter to see if they would stay crisp, 3 hours and I had to eat the last one. LOL! I made a sour cream and curry dipping sauce, but they were perfect without it. Thank you so very much for posting your photos, Kathy, and I am so glad you enjoyed and I am going to try the sour cream and curry sauce myself because I love curry! Thanks for the curry tip and the giggle that the phyllo wasn't 'crispy' on the first try. Oh my, don't we all have some minor disasters (and some major - LOL) on our first go round with a new recipe ;-) Can't even count how many for me over my cooking life LOL!